Website: Click here to see proposed changes! The public is asked for input on the proposed fare and pass policy changes. Public input may also be given during a Public Hearing at the Board of Commissioners meeting on June 28. 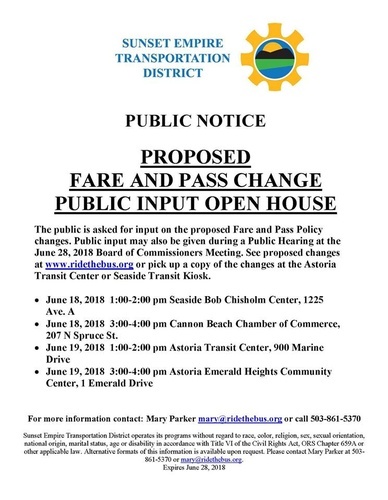 See proposed changes online or pick up a copy of the changes at the Astoria Transit Center or Seaside Transit Kiosk. Tuesday, June 19 - 1 to 2 p.m.